The modern military shooter genre is getting old. It’s getting really, really old. At least when everyone decided to rip off Mario we got some interesting new platforming mechanics out of the deal. At least when everyone was copying Bejewled we got hidden gems like Puzzle Quest. Even the shooter craze spawned by Halo got us some unique sci-fi settings. But ever since Call of Duty fast-forwarded its setting with Call of Duty 4: Modern Warfare, we’ve gotten a slew of samey military shooters with weak stories, bland art direction, stereotypical characters, lazily-designed campaigns made as an afterthought to the multiplayer, and the exact same basic shooting mechanics as every other game in the genre. So you’ll forgive me for having passed off Spec Ops: The Line as more of the same. Until I played it, at least. This game is anything but the same. Well, largely. The mechanics are largely familiar; third-person, cover-based shooting reminiscent of Gears of War, with the more realistic damage thresholds of Call of Duty and a splash of strategic squad commanding that makes it feel mildly tactical at best. It does a few cool things with the control scheme, but it’s still pretty simple. And the multiplayer is basically third-person Call of Duty with an even more poorly-balanced leveling system that ensures those who have played longer will win easier. The campaign’s gameplay is enjoyable but unremarkable, and the multiplayer is functional but forgettable. What sets this game apart and ensures it a permanent place in your memory is the story. In a genre mostly consisting of simple invasion plots, overly simple morality (despite the gunning down, however justified, of hundreds of your fellow man), and characters that never rise beyond the most basic of character tropes, Spec Ops: The Line tells the story of a soldier’s slow descent into madness as he loses more and more of his humanity to a conflict in which there is no clear right and wrong, only what seemingly “needs to be done.” When Dubai is all but destroyed by a horrifying and seemingly endless sandstorm, the soldiers sent to evacuate the city drop from contact for months. Captain Martin Walker is sent with a small team of two other soldiers to investigate. But when the refugees turn out to be hostile, Walker and his men are seemingly stuck in a battle for their survival in a place that ensures a high cost for such determination. A story like this can be powerful (especially in an interactive medium such as video games), but certainly is not fit for all age groups. So let’s see who should be playing this game in the first place before we get into why those who do will find it rewarding. This is an intensely violent game. Not just because of how graphic it is; the sheer amount of blood and gore has nothing on the likes of Gears of War. But this game sets out to depict war as absolute hell, and it pulls no punches in doing so. This violence is not for some sick satisfaction, but a disturbingly brutal and real portrayal of the horrors of war. Most of the in-game violence is fairly typical. Blood splatters when an enemy is hit. A larger amount of blood splatters on the floor or wall when an enemy is hit in the head. It gets a bit more intense than normal when explosive weapons blow enemies to pieces and headshots from powerful weapons blow enemies’ heads off. 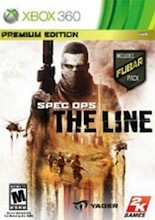 While most games make some sort of flourishing “finishing move” out of killing an incapacitated enemy, Spec Ops: The Line portrays it as a mercy killing. It’s not necessary (I couldn’t bring myself to do it after the first time), but when enemies you’ve downed are dying, gasping, writhing in pain as the blood drains from their bodies, you can end their suffering with a quicker and less painful death. At first, at least: more on that in the conclusion. There are multiple occasions on which the player comes across dead bodies that have been mutilated in one way or another. The most extreme example involves the use of white phosphorus, which is something you would be wise to resist Googling if you want to keep whatever food may be in your stomach. It causes horrible burns, and the results are revolting and highly disturbing. Spec Ops: The Line seems to have made sure to accurately portray this weapon, and makes the player walk through a battlefield full of dead, dying, and burning soldiers. It also provides a few close ups of some dead bodies, people who had obviously been desperately trying to escape the blast. It is meant to be a gruesome and disturbing sight, and it really, really is. – The word “c*nt” is used sparingly (only once that I heard). – The F-word is used throughout the game. – The S-word is used throughout the game. – The word “damn” is used throughout the game. I’m going to spare some space and just say that if there are any “lesser” curse words in existence, they’re in this game. Again, a bit more on the language in the conclusion. This game is full of moral ambiguity. Namely, the game is about the protagonist trying so hard to be the hero of Dubai that he does horrible things in the names of self-defense and the greater good, and is driven mad as a result. More on that in the conclusion. There is no way I would ask a child to play this game. Spec Ops: The Line is a powerful experience. It is obviously not one that should be played by a young audience, but for those who can handle it, I must give it a heavy recommendation. Because for all the talk of shooters being “empowerment fantasies” and heartless killing sprees, here is a game that breaks this trend and presents a tragedy that the player is not only powerless to stop, but is in fact unwittingly and hesitantly pushing forward. This is what makes Spec Ops: The Line such a powerful experience. The player does what he/she is told because the game demands it of them, but begins to question their actions more and more as the game progresses. Walker and his men begin to lose their cool. Their actions, performed in the names of self-defense and the greater good, seem to do more harm than good. This does not justify the gunning down of hundreds of enemies by shrugging and emotionlessly stating, “They’re the enemy,” as most modern shooters do. Spec Ops: The Line tells a tragic story that never should have taken place. It doesn’t try to justify a thing. In doing so, it answers the question of whether a video game can express the horrors of war while simultaneously making a game out of it: absolutely they can. And it can be unforgettably powerful. But obviously, it’s not for everyone. The level of violence and intensity of the language exists for a reason in this game, but in no way is it appropriate for younger players. After detailing the content, I don’t think I even need to tell you to keep this one away from your kids. But if your son or daughter is mature enough, and especially if they primarily or exclusively play games of this genre, I highly recommend Spec Ops: The Line. It will certainly give them more to think about than any other games of its kind.